I’m not usually a ‘blog every day’ kind of girl. I don’t think I’m that interesting for a start, but also I really don’t often have something to talk about every day. But lately I’ve been blogging a lot more frequently. This has to do with two things; I rarely have anything to do at work in the mornings and so I need something to fill my time, and I need to keep my mind occupied so I don’t focus too much on the negative things that are swirling around me at the moment. I am trying very, very hard to keep on top of it all, and to stay positive and try and not let the bad stuff bring me down, but it’s not easy. Plus, I made a promise to myself to write 200 words per day, and even if it may not be for my current writing project, it has to be for something. And thus, lots of blog posts. So, I was going to actually write about this yesterday, but my thoughts about Bourke St seemed more appropriate at the time. I started thinking about this post as I was driving to work yesterday. It wasn’t a particularly warm day, despite the fact that we’re coming up on the hottest month of the year, and the sky to the north of my house (in the direction of the city) was dark and moody, with the tease of a storm in the air. As I drove towards those imposing clouds, the contrast of the sun at my back seeming to turn them a darker shade of gloom, all I could think was that I wanted to chase them. And there was a part of me that would have done so, if it weren’t for my sense of responsibility urging me towards my place of employment instead of in the direction of the storm I so desperately long for. (which ultimately died away before it got much more interesting than light showers anyway). All I wanted, all I want is to drive away from this city and never come back. It’s been just shy of five months since I moved. Hardly a long term commitment to city living. But already, I’m itching to leave. 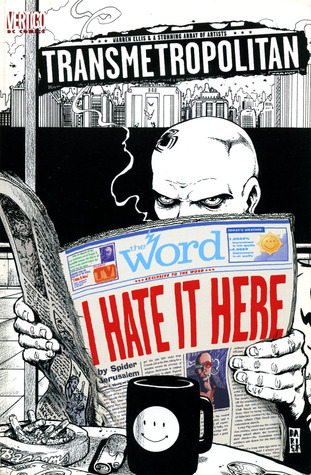 In the words of my eternal hero, Spider Jerusalem; I hate it here. It’s a lot of things that contribute to this all consuming hatred for my current way of living. I miss living on my own, I miss not having to commute for an hour to get to work, I miss having a job that didn’t make me miserable. And it seems ever since moving to this shop, things have been going wrong and getting progressively worse, to the point where I doubt every single day, my ability to do my job. There is a possible opportunity for advancement within my job in the coming months. An opportunity that has the potential to get me set up for a good long while. But the more I think about it, the more I realise that I’m not sure I want it. Yes, it would be a good opportunity for me, and yes I could say that I had achieved something big at the age of 24. But the crushing anxiety and doubt may just be too much for me to handle. And I know that doesn’t exactly sound like it fits in with my whole positive vibe, but the flipside is that my mental and emotional health is going to be at rock bottom if I continue like this, and I firmly believe that my health and happiness is more important than any amount of money. Though I still don’t think leaving my home town was the wrong move, I think the place I moved was the wrong place. I come from a big country town/city, and it seems all the things I grew to hate about it in the year or so before I moved, are now the things that I once again long for. Go figure. The problem is, to return to that town would be inevitably taking a step back, and that’s not the direction I want to go. I want to keep moving forward. And so last night, I did a thing. After day long consideration, I applied for a job in another state. It would be a huge move so soon after my first big move, but I figure what the hell? I’m not going to stress about it, I’m just going to wait and see what happens. If I hear back, then I can take it as a sign that it was a good decision. If I don’t hear back, it just means that it wasn’t the right opportunity, or the right time. I haven’t had much luck making my own decisions recently, so I’m going to leave it in the hands of fate. As my best friend often tells me; the universe provides. Whatever happens now, all I know is that this isn’t what I want, and it isn’t where I am meant to be. And I’m tired of being unhappy with the live I lead. I want to experience things, and I want adventure, and I want to live. No more of this stagnant, boring existence. I told myself things were going to change, and this time I’m not going to let myself be held back, by myself, or anyone/anything else. This is my time.